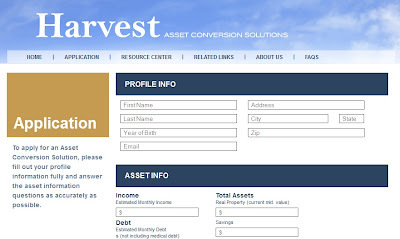 MY Blog: Harvest Asset Conversion Solutions - Best solution for your Medical Debt! Harvest Asset Conversion Solutions - Best solution for your Medical Debt! In short, Harvest Asset Conversion Solutions convert a life insurance policy or a structured annuity into a cash asset while relieving the policyholder of the premium liability. In reality, many people face varies medical illness, from minor cough and cold, to severe disabling illness such as cancer, limb amputation, mental illness, and others. Certain chronic medical conditions disable the patients from continue to work and earn a living, some require long-term expenses, such as kidney dialysis in chronic renal failure patients. With ongoing trend of diabetes and hypertension nowadays, it has contribute to the primary cause of kidney failure. No work = No income. However, with Harvest Asset Conversion Solutions, it helps by converting life insurance, a structured annuity, or similar financial instrument into readily available cash. The conversion of these financial instruments will require assigning the benefits to Harvest and any current or future costs will be paid for by them. Applicants will receive a lump sum cash payment, which can be used for immediate emergency, or to be used later for any chronic illness. As part of a change in estate planning or investment objectives. To pay for healthcare costs for you or someone in your family. To fund a more cost effective life insurance policy. One out of every three settlements results in the insured creating a new life insurance policy. Premium payments are no longer affordable, or have become excessive. An alternative to surrendering the policy. To provide a cash gift to family members, or to a charity. As you can see from the criteria, Harvest was established with the intention to relieve the financial situation of a ill family (with expected life span of less than 2 years). Of course there are always other options available, such as getting a loan from family or friends, take out additional credit, or receive accelerated benefits under the life insurance policy. Sadly, these will only add on debts to their existing financial situations. Fill the form online now to see how fast they respond! Applicants can decide whether to sell the entire policy, or a small portion from the policy. Normally approved within 6-8weeks from date of applications. Don't wait until the last minute to apply. Take this as the first choice of your options. Don't leave your debt to your families. This was a very interesting article about getting over medical debt! A friend of mine was just telling me about structured annuity and structured settlements so I have been trying to read whatever I can find on those subjects. Thank you for sharing! Great post. My aunt just received a structured annuity payment. I don't really know what that is so I have been doing research, that is how I came across your post. I am glad I did because this post is by far the best post I have read all day. Thanks so much for sharing. IPad Video Lessons - Know your iPad in & out! 12 Months Loan Net - Less Paper & Fast Approval!